Gary James, lead in Economy Spring’s spring manufacturing area, operates a Torin spring maker that sorts springs by size as they’re produced at Economy Spring’s Southington, Conn., manufacturing facility. Photo by Mark Langlois. Rising costs and a nationwide worker shortage aren’t stopping American spring and wire manufacturers from improving their skills and hiring new workers. Economy Spring and Stamping, in Southington, Connecticut, is trading in its 85,000-square-foot manufacturing space for another that is 216,000 square feet in size. That sounds like it more than doubled in size, but Tim Thompson, senior vice president and general manager of Economy Spring, explained that Economy is entering a long-term lease and renovating a former aircraft engine manufacturing plant in Southington, but it isn’t a one-for-one space trade. In addition to its existing 85,000 square feet of manufacturing space, Economy leases more space in several other buildings outside its plant. “We’re bringing it all into one,” Thompson said in a telephone interview with Design-2-Part magazine. He said Economy added 75 employees in the last two years, and with the expectation of occupying the new factory next year, Economy will add another 100 jobs over the next two years. Economy’s biggest markets are medical, aerospace, electronics, and general industrial. The expansion is driven by rapid growth of Economy Spring’s coiled springs, wire forms, stampings, and product assemblies sold to customers for medical and pharmaceutical applications. 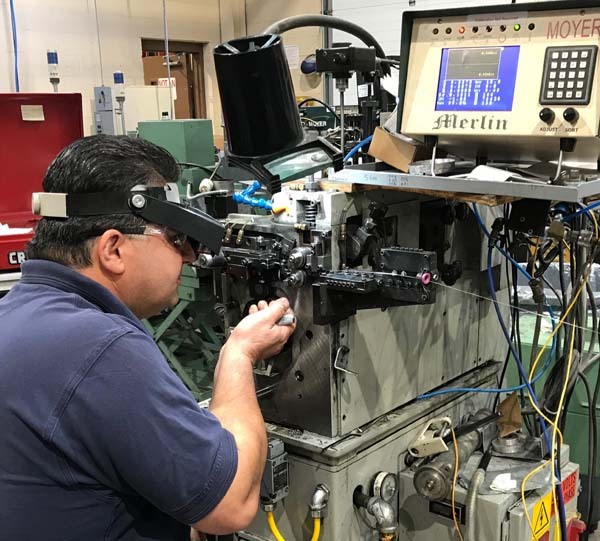 Sal Darragjati, a machine set-up specialist with 20 years of experience, is using Moyer and Merlin controls to set up a spring maker to form tiny springs at Economy Spring’s Southington, Conn., manufacturing facility. Photo by Mark Langlois. Economy Spring (https://www.mw-ind.com/brands/economy-spring), a part of MW Industries, Inc., is ISO 9001:2015 / AS9100D certified and is an FDA registered facility. It has plans to obtain ISO 13485 certification (for medical devices) by year end and has an ISO 8, Class 100,000 clean room. It is ITAR compliant and a member of both the New England Scientific Manufacturers Association and the Spring Manufacturers Institute. The company manufactures custom precision wire forms, coil springs, metal stampings, tubular components, and component assemblies for customers in numerous industries. One of its specialties is turning around prototypes within three to five days. Spring and wire form trade associations report business is strong and workers are scarce. FTR Associates (https://www.ftrmetalproducts.com/) employs about 52 people in two buildings of roughly 25,000 square feet. Its full service, in-house tooling department includes two wire EDM (electrical discharge machining) machines and one sinker EDM machine. “In addition to manufacturing new tooling, we can also repair and maintain your existing tooling to insure consistent good quality products,” FTR said on its website. FTR prides itself on being a full-service manufacturer to a variety of industries, offering high quality parts at very competitive prices, as well as a number of secondary and finishing services. Among these services are tapping, welding, grinding, anodizing, deburring, heat treating, assembly, polishing, powder coating, and special packaging. The company’s recent acquisitions of manufacturing equipment include a Mitsubishi Wire EDM Mach Model BA8; two Herdan CSX-20T Hybrid CNC Spring and Wire Form machines; and a BK 3D Wire Bender, Model WB 110. 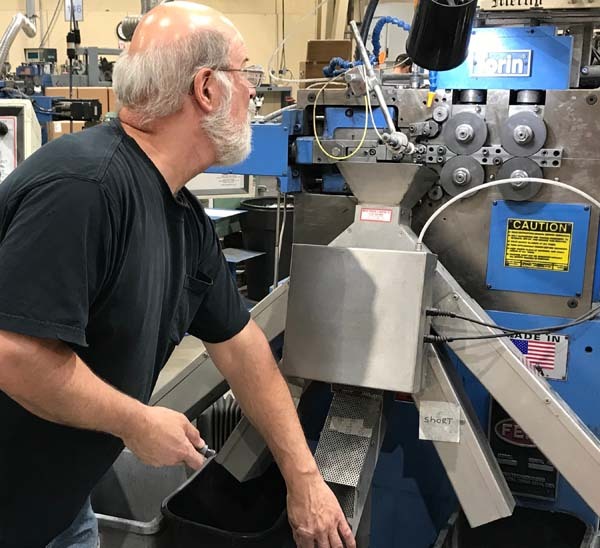 Donley said that high precision and tight tolerances are a trend in the spring manufacturing industry because each year, new machines improve the tolerances over older models. The trade association said it focuses on the similarities and shared goals of its members. Newcomb Spring recently added custom wire bending to its range of manufacturing capabilities. CNC automation gives Newcomb the capability to bend wire with repeatable accuracy in materials from standard steels to premium exotic alloys. Photo courtesy of Newcomb Spring. Donley’s observation regarding the trend aligns with those of Joshua Kahn, president of the Chicago Association of Spring Manufacturers Inc., a trade association founded in 1944, and with those of David Padgett Sr., president of the Wire Fabricators Association (WFA), a national trade organization founded in 1976. The Spring Manufacturers Institute, founded in 1933, works to strengthen technical knowledge about spring making for its members. Spring association leaders say that spring manufacturers are making tighter tolerance springs with more automated equipment, using fewer people. And manufacturers do that while paying higher prices for the raw material, all while under the gun to lower their costs. Donley said the hardest thing is finding new employees. She said the West Coast Spring Manufacturers Association talked over the problem many times in association meetings, and during those talks, they realized a few things. People trained to run four-slide machines do not come out of trade schools or colleges. “We train them,” Donley said. The association’s idea was to create an apprenticeship program to train new workers themselves. Who better than the association members to train workers who would then work for the association members? This was exactly what the members wanted. Finally, a plan that would work. It didn’t work because the program never got off the ground. The spring makers knew what they had to do, but they couldn’t do it. “We can’t take someone off a machine. We don’t have the time to train them. Every one of us is short-handed and understaffed,” Donley said. The industry is still looking for a solution to its worker shortage, but there also appears to be plenty of work to go around. Newcomb Spring Corp. is a major spring and metal form manufacturer with over 100 years in business. Headquartered in Alpharetta, Georgia, the company also has manufacturing sites in Stanton, California; Thornton, Colorado; Dallas, Texas; Decatur, Georgia; El Paso, Texas; Ooltewah, Tennessee; and Southington, Connecticut. 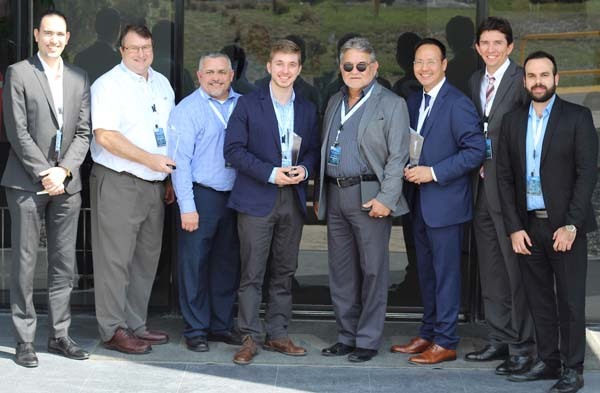 Newcomb Spring and Siemens associates celebrate a year of successful collaboration at the Siemens supplier awards event in Nuevo Leon, Mexico. Photo courtesy of Newcomb Spring. Newcomb Spring moved its world headquarters from Decatur, Georgia, to Alpharetta, Georgia, at the end of May, a move that opened additional space for manufacturing, quality control, and administration in the Decatur plant. Newcomb reported the move did not impact jobs. At the same time, Siemens gave Newcomb Spring its 2017 Siemens Supplier Excellence Award for providing superior performance in logistics, quality, commercial performance, and technology performance. Newcomb Spring delivered “tens of millions of springs,” to Siemens without a single non-conformance. “Our partnership with Siemens goes back over 35 years, and this award exemplifies our commitment to high-quality precision manufacturing and customer service,” said Keith Porter Jr., general manager of Newcomb Spring’s Gastonia, North Carolina facility, in a company release. Newcomb added custom wire bending CNC equipment in June for a range of industries, including transportation and automotive, agriculture, retail displays, home furnishings, kitchen and bath, appliances and housewares, medical, and veterinary accessories, among others. The company said in a prepared release that its new CNC automation gives it the ability to bend wire with repeatable accuracy. Materials range from standard steels to premium exotic alloys in shapes ranging from round to rectangular to special-section. Newcomb Spring announced a new general manager of its Thornton, Colorado plant in November, promoting Nathan Watson, who started with Newcomb Spring in 2012 as a CNC set-up technician and operator. He was later promoted to shipping and receiving supervisor, and after that, he was promoted to plant production manager. After serving three tours of duty in the Middle East, Watson graduated from the University of Denver with a degree in molecular biology. In another company promotion, Jason Bingham was promoted to general manager of Newcomb Spring’s Ooltewah, Tennessee plant. Bingham joined the firm in 2000 as a quality technician, and he was promoted to quality manager a year later. He was named operations manager in 2008. Bingham earned his Bachelor of Science in engineering from Virginia Tech. 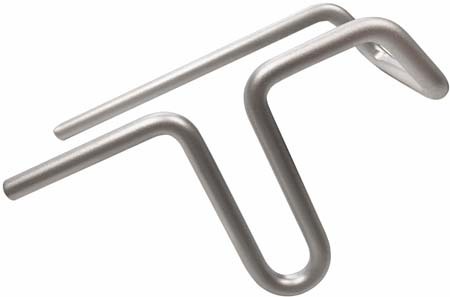 Newcomb Spring introduced BAM in April, which stands for “Big A*S Manufacturing” for heavy duty springs and heavy-gauge wire forms, including wires up to 0.625-inch. The company’s BAM department is capable of producing different types of heavy-duty springs, such as compression springs, extension springs, and torsion springs. Jacobson said the new heavy-duty manufacturing department will better help customers meet their precise specifications, as well as meeting critical standards for performance and reliability. Newcomb expects customers in various industries will use the company’s BAM facilities. This includes companies that provide products to the construction, agriculture, aerospace, defense, energy, and mining industries, among others. These industries use equipment and machinery that must withstand heavy loads and extreme forces. “What it offers you are large capacity CNC forming machines and specialized engineering know-how to manufacture heavy-duty springs and wire form parts that meet your specifications for quality, performance, and reliability,” Newcomb said in its announcement. Newcomb Spring (https://newcombspring.com/) also offers a wide range of finishing services so that the heavy-duty springs and wire forms arrive ready to install. Those finishing operations include anodizing, black oxide, electroplating, grinding, stress relieving, passivation, shot peening, and tapping. Other operations include assembly, chamfering, looping, heat treating, painting, powder coating, swaging, and welding.